Jeanni offers various classes in basic skills, color, and composition in both drawing and oil painting throughout the winter season. These classes are available as individual private lessons for students of any experience level (by appointment only), or in group class settings at her Creative Expressions Studio & Gallery. Whether new to painting, interested in exploring the challenges and rewards of using oil paints, or would like a refresher course, this class will cover the basics: use of materials and tools; brush and pallet knife techniques; light and values; color mixing and composition. Traditional methods are used to create paintings with depth and visual interest. 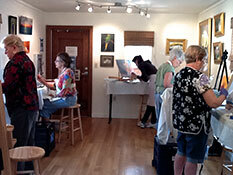 Classes include demonstrations, one-on-one instruction and critique in a small group artist studio. 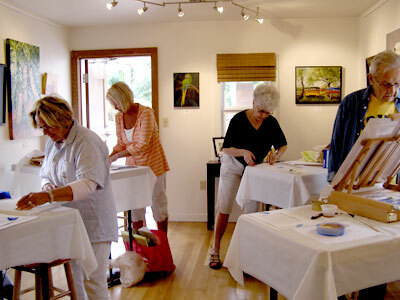 Individuals are encouraged to develop their own personal style of painting. Space is limited to 5. The focus for these classes is on exploring methods for creating paintings with dimension/depth and strong viewer appeal using light, color and good composition. Instructor demonstrations and student hands-on projects are used at the beginning of each class for the first few classes. Students are then encouraged to use these methods on individual projects using their photo references or still life composition. As always, the objective to improve individual’s painting skills remains the same, along with the opportunity to have a good time sharing the experience with a small group of artists who enjoy fine art painting. Previous experience with basic drawing and painting skills is required. Space is limited to 6.
gathering with others who enjoy creative activities..."
The focus for this class is on exploring methods for creating paintings with dimension/depth and strong viewer appeal using light, color and good composition. Instructor demonstrations and student hands-on projects are used at the beginning of each class for the first few classes. Students are then encouraged to use these methods on individual projects using their photo references or still life composition.